Cross-hole deburring is an essential finishing operation for precision metal parts. In engine and transmission components, cross-drilled holes serve as conduits for fluids, lubricants, and greases. If burrs block these passageways, problems can result. Metal burrs in cross-drilled holes can also affect dimensional tolerances and lead to part misalignments. Manual cross-hole deburring can be time-consuming. Manufacturers and machinists can outsource deburring operations instead, but this adds time and costs to precision metal parts. 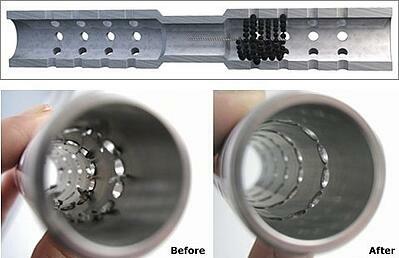 That’s why in-house, automated cross-hole deburring is an attractive, cost-effective alternative. With BRM Flex-Hone® tools, you can use your own CNC machinery or other production equipment to get great results. Made in the USA by Brush Research Manufacturing (BRM), the Flex-Hone® is a flexible, resilient honing tool that removes burrs and improves surface finish at the same time. For automated operations, the Flex-Hone® can be used with CNC machining centers, robotic cells, or transfer lines. This unique metalworking tool mounts with a Jacobs-style chuck and is suitable for use with most any rotating spindle. 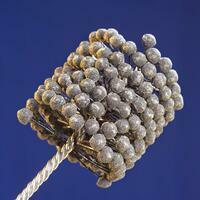 Flex-Hone® tools feature nylon abrasive globules or balls that are permanently laminated to flexible nylon filaments. Unlike other cylinder hones, BRM’s flexible hones are self-centering, self-aligning to the bore, and self-compensating for wear. Their low-temperature, low-pressure abrading process also removes surface imperfections while leaving the underlying structure of the base metal undisturbed. Flexible honing develops a surface condition that’s free of fragmented, amorphous, or smeared metal from previous machining operations. With cross-drilled holes, BRM ball hones – as Flex-Hone® tools are sometimes called – can also smooth edges and produce a blended radius. Ball hones aren’t designed for heavy-duty material removal, however, so precision metal parts retain their dimensional tolerances. As this YouTube video shows, Flex-Hone® tools that are used with automated equipment can remove burrs efficiently, uniformly, and cost-effectively. BRM's deburring tool enters the bore while spinning and, after a few clockwise strokes, is rotated counterclockwise. This forward and reverse rotation creates a symmetrical deburring pattern. To learn more about automated deburring for cross-drilled holes, look for the article about Brush Research Manufacturing in the September 2017 issue of Fabricating & Metalworking magazine. You can also contact us on-line, or visit BRM at WESTEC 2017 in Booth #2408 or EMO 2017 in Booth #A47, Hall 011. In addition, the Flex-Hone® Resource Guide is available for download any time.